In Ep. 038, Tim talks with Daniel Crosby. Daniel is a PhD psychologist, a New York Times best-selling author, and a behavioral finance expert. 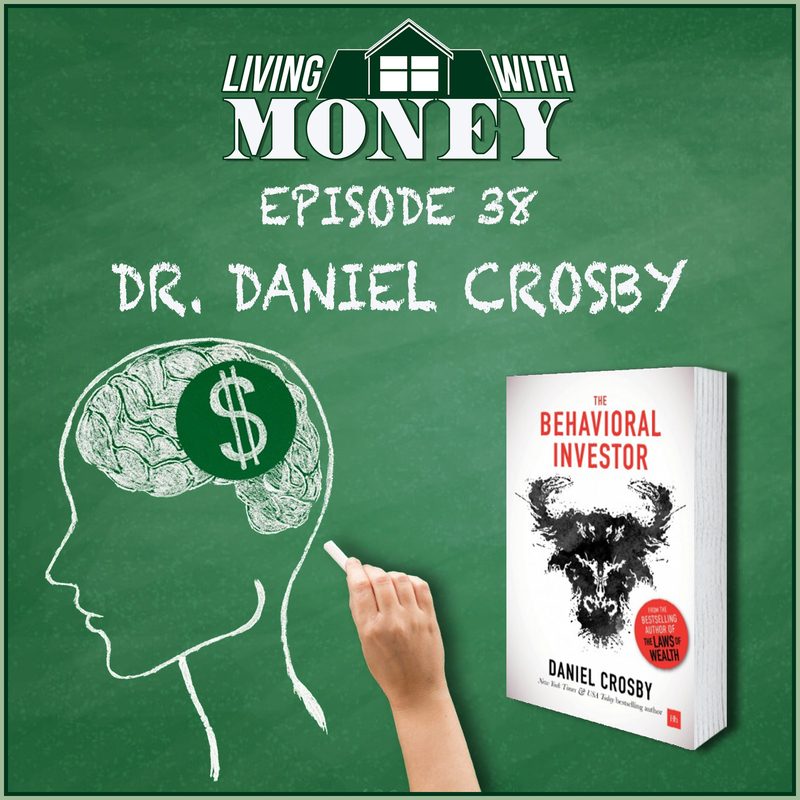 They discuss Daniel’s upcoming book ‘The Behavioral Investor’, due out next Tuesday Oct. 16th! They talk about external factors and psychological tendencies that every human have that can negatively affect their investment decision making. Be sure to pick up a copy of the book next Tuesday! Tim: Welcome back to Living with Money. This is Tim Mullooly. On today’s episode, I’m joined by Daniel Crosby. Daniel is the founder of Nocturne Capital as well as a PhD psychologist and a New York Times Best-selling author. Daniel, thanks for coming on the podcast. Tim: For the listeners out there, can you just give us a brief background on you and how you got started in the industry and what got you initially interested in finance and psychology? Daniel: Yeah, so I am the son of a financial advisor so I grew up, he’s still a financial advisor, and so I grew up sort of steeped in this world. I always joke that debt was a four letter word in my house because it really was. My dad literally would not let us say the word debt. I grew up in a home where money and investing were very much top of mind, very topical, always discussed at the dinner table. But that said, I wasn’t all that interested in it. I had sort of the option to take over my dad’s business and passed on it. Decided I wanted to go my own path and my passion was for psychology and I was going to be a clinical psychologist, and so did an undergrad in psych. Got into a PhD program in psych that I started three days after I finished my undergrad. About three years into my PhD program though, I was just burning out. I was seeing 40, 50 clients a week, and talking to 50 people a week on the worst day of their life was just, it was just a lot. It was getting to me. I was internalizing a lot of the stress. I loved the field of psychology. I love thinking deeply about why people behave as they did but wanted to apply it in a non-clinical setting like in a setting where no one would die if I had a bad day. And so I began to look into business applications of psychology and long story short, my first job out of college was with a small consultancy here in Atlanta and we did work for SunTrust Bank, and so at SunTrust in my consulting gigs with SunTrust, I got exposed to the world of behavioral economics and the rest is history. Tim: I also grew up in a household with a father as a financial advisor so I work with him now, so I relate to growing up in a situation like that. So the main focus for today, we wanted to talk about your upcoming book called The Behavioral Investor. For everyone listening out there, it’s due out October 16th of this year so coming soon. For you, Daniel, what made you want to sit down and write this book? Daniel: The enormous wealth that accrues to someone who writes a book was really my goal. No, it’s a horrible business decision but it’s a lot of fun. Really the thing that made me want to write this book was squishy answers out of conference. I was mediating a panel of “behavioral finance experts” at a conference. Asking all these what I supposed to be hard hitting questions about the future and the current state of behavioral finance. I found that all these experts widely esteemed as they were, were answering in kind of witty aphorisms and folk tales and sort of common sense logic but no one had much backing for some of the things that they were saying, so I set out to write a book that was a synthesis of all of the extent literature on what it means to be a behavior first investor. So my peers giving dumb answers at a conference. I feel like is the answer to why I decided to write the book. Tim: So you wanted to give more details than just kind of anecdotal personal evidence that you’re hearing from people at that panel? Daniel: Yeah. I had Dan Egan, who I know you on, I had Dan Egan on my podcast recently and he gave a great example. He works at Betterment. They found that when they reach out to people during a volatile time in the market. When they proactively reached out to their clients, the clients behaved worse. And so there’s all sorts of these things that sort of make sense on their face. Like well that doesn’t seem like an unreasonable thing to do to reach out to your clients when the market is volatile. But because Dan and company took a scientific research-backed approach looking at this, they moderated their approach and so that’s all I was trying to do was to take some of these assumptions about behavioral finance and just dig into what the research said about them and simplify them and share them with the world. Tim: In the book, it gets broken down into four different sections. Do you want to talk a little bit about what each section is and a little bit of what a reader could hope to take away from the sections? Daniel: So section one talks about external factors, so specifically sociology, physiology, and neurology, so how do society, your body, and your brain impinged on your ability to make optimal financial decisions? The answer is they do so quite dramatically, and we exist in a world that doesn’t prime us to make the best financial decisions so flowing from that there are, the next section is all about behavior, about the psychological factor. And so basically, it’s a funnel that because we exist in a world with a body and a brain that leads us to make bad decisions, we exhibit behavioral biases, so that will be the second chapter, or the second section rather, talks about the primary types of behavioral biases that we exhibit. The third chapter is, the third section rather is sort of this so what of it all, okay, we exist in this bad place for making decisions. It manifests itself in predictable ways, so what do we do about it? And then the fourth tries to get even more granular and say okay specifically what might a portfolio look like that is guided by these behavior first principles. Tim: So each section builds on itself and widdles it way down a funnel down to the fourth section where you apply it to everyone’s actual life and what they can actually do with that information? Daniel: Yeah. That’s the hope, certainly. I think early on in my speaking and writing career and frankly probably to this day, the most common criticism that I get is okay, that’s fun information but like what the heck do I do with it and so I wanted to be as concrete as possible. I wanted to be as thorough but also as concrete and say look this is what your brain and body are like. This is the kind of psychological bias that leads you do, and this is specifically what you can do about it. Tim: Right. I feel like that criticism is common across a lot of different personal finance related books too. It’s a lot of good information but it sometimes leaves readers thinking okay how do I actually apply that to my everyday life. Daniel: Yeah. There’s two types of people in the world. Actually that’s a terrible, you should ignore someone that says that every time. But there are really two types of people in the world. There’s people that deal in the world of the philosophical ideas and possibilities and there’s people that deal in the world of the here and now and concreteness. If you look at a number of personality tests, you’d see some sort of construct that measures those things. I don’t personally need a lot of concreteness, I’m very happy with the philosophical side of things. But that leads me to underserve people who want more practical applied stuff. Hopefully there’s something in here for personalities of all types. Tim: Right. You mentioned in the first section there. Different external factors and how they can interfere with our ability to make decisions. What are a few of those external factors that you’re talking about and how might they play into decision making in everyday life and then also into the investment process as well? Daniel: Yeah. At the highest level, we’ll begin with sociology. At the highest level, the thing that differentiates humans from other animals and we forget that we are animal sometimes but we are. The thing that differentiates us from other animals is not opposable thumbs, it’s not language. Plenty of animals have both of those things. The thing that differentiates us is that we believe in what I’ll call functional fictions. So a functional fiction would be something like an economy. Something like an economy or a fiat currency that’s valuable because we say it’s valuable and we all agree that it’s valuable. If you look at something like the constitution or the borders of the state of Georgia or a religion or any kind of social order, all of these are just widely agreed upon social constructs, and they’re really awesome because it means that I can get on a plane to Paris tomorrow. Fly to Paris, get off a plane, and buy a croissant from someone I’ve never met before because we’ve agreed on this functional fiction of an economy and an exchange rate, and a fiat currency. You don’t see that with other animals, so you don’t see that with other animals. They only know as many other animals as they can get to know them well because that’s the limits of their trust and their ability to function so you see apes and chimpanzees will know sort of a max of about 100 or 120 other animals. We can do business with people we’ve never met before, and we’ll never meet again. So that’s the good news. The bad news is though it sets us up to reason in social ways. We are very much primed to differ to the herd in defining what truth is, and as I’ve said this is the very thing that sets us apart. So the same thing differing to the herd when defining truth that allows me to buy that croissant in Paris is the very same thing that causes me to follow my neighbor into buying Tilray and Bitcoin. So everything is a mixed bag so the very thing that makes us special and makes us able to build civilizations also leads us to run with the herd so that’s one example of how at a very high level sociologically we’re not setup to think in rational terms or setup to think in herd terms. To round up the section a bit, I spent a long time on sociology but there’s a couple of chapters on biology, where I quote stuff. I think the funniest study in the biology section or the physiology section rather talks about people who needed to urinate actually made better financial decisions. Daniel: Yeah. I know it’s not what I would have guessed but they call it inhibitory spillover, so someone who is already holding it, someone’s who’s already exercising restraint not to pee, they also that restraint spills over into their other actions and they exercise restraint in their other actions including financial decision making so again our bodies are miraculous. Our bodies are absolutely miraculous, unparalleled creations on the one hand. But on the other hand, they’re very weak, like what you had for dinner or how much coffee you had that morning or even something as silly as how much you need to pee could lead you to make good or bad buy and sell decisions. And then finally on the brain portion, on the neurology portion. I talk about how our apparatus is just ill-equipped specifically we’re old and hungry, our brains are old and hungry. Formal stock markets like the ones that we operate in are about 400 years old and yet our brain hasn’t changed appreciably in about 150,000 years. So it’s wired in a way that’s not consistent with the needs of the day and it’s also very hungry. It takes up about 20 to 25% of our metabolic spend in a given day, and yet it’s only about 2 to 3% of our body weight. Since it’s so hungry and metabolically wasteful, we’re always looking for ways to think less and one of the primary ways that we do this, we watch financial talking heads, we defer to our neighbors, we get a stock tip at a cocktail party, all these things allow us to sort of shut our brain off, which is something we’re all looking for candidly. The cards are stacked against us at a societal physical and mental level, the cards are stacked against us. Tim: That funny thing about having to urinate. That’s the opposite of what I would off the top of my head think you would think if you’re trying to not go to the bathroom, you want to make a decision as quick as possible, so it might make a rash decision not really think over what you’re considering but that’s very interesting that it’s actually the opposite of that. Daniel: I would have guessed the very same thing as you which is why we do the science, I guess. Tim: Yeah, so in that second section of the book. You were talking about different tendencies that impact every human, specifically there’s four that you highlighted in the book. Can you talk about one or two or all four of those tendencies that you’ve described in the book? Daniel: Sure. So what I did was I took the universe of identified investment misbehavior, sort of all the biases and heuristics that have been identified by people smarter than me, and there were over 100, and as I looked to them I started to say look a lot of these share sort of a common core, a lot of these are under-gird by similar things, they may be slightly different but there’s a common mechanism at work and so I broke them down by their common underlying mechanism, and I arrived at four primary psychological tendencies. So they are as follows. The first of those is ego which is our tendency to be overconfident and to think that bad stuff won’t happen to us. The tendency to think that bad things won’t happen to us and also the tendency to think that we’re better than our neighbors. This leads us to make all manner of bad financial decisions basically because we think that the rules don’t apply to us. The second of these is emotion which is the tendency for our fleeting affect to color our perceptions of risk and reward, so you asks someone who’s having a good day, how risky something is, and they’re going to say it’s much less risky than someone who’s having a bad day. Even our appraisal of activities is highly contingent on emotion. You look at something like boating. Boating is super dangerous but no one thinks it’s dangerous because it’s fun. You’re having a good time when you’re boating but it’s actually quite dangerous. That danger is getting to you by the fact that it’s fun and you’re emotionally up. The third of these is attention. Attention is our tendency to conflate or to confuse rather probability and salience. So salience is something like how vivid it is, how easy it is to recall something and probability being how likely it is to happen so my favorite example of this is that in the last year way more people have died taking selfies than with shark attacks. I think it’s 5X the number have died taking selfies as shark attacks and yet, if you ask me to take a selfie I would, and if you ask me to swim with a shark I wouldn’t because one seems scary, one is more salient, one’s more vivid as a risk and so we confuse the likelihood. You’re far more likely to try and take a drunken selfie and walk into traffic. The last one is conservation which is our tendency to privilege the status quo and what we know over what we don’t. One of the easiest examples of this is home bias. People invest in their own country, disproportionately, and even if you look at different parts of the US, people in the northeast are overweight financial stocks, people in the Midwest are overweight agricultural stocks. We think that because we are familiar with something that it’s safer and that’s again simply not the case. Tim: Yeah, and another example that popped in my head when you were talking about that last point is sometimes we have people that come in and they want to buy a company or a stock that their headquarters is down the street from their house. Their reasoning is well I drive by it every day, it looks like a really nice building and a good company. When in reality that has no impact at all as to whether or not it’s a valid investment for them. Daniel: So it’s interesting. So two things to say here, first of all, if it’s down the street from your house, it’s the riskiest thing of all because you live in a house whose value is predicated on the strength of the local economy and businesses like the one that’s down on the street from your house, so you may already work at that place which makes it doubly risky, it’s part of your community, it’s triply risky. It’s very very risky in a way that’s intertwined in a way that people don’t realize, and I have this vivid memory of being a kid going to New York for the first time and my dad taking me by the headquarters of one of the mutual fund companies that he had a bunch of his clients in. And we went to it and I don’t remember where in the city it was but it was a dump. We came out and I was like dad, that place was kind of terrible, and he said yeah, son, that’s why I give them my money because they’re not wasting it on, they’re not wasting it on mahogany desks and glass buildings, it’s all going where it needs to go, so those externalities can be alluring but they’re ultimately wrong-headed I think. Tim: I’ve read that you said all successful investing has psychology at its core, and I completely agree with that. So with that, I’d ask what percentage of successful investing would you say is understanding the important psychological aspects of humans and how our brains work versus understanding the nuts and bolts of the actual investments that are held in people’s accounts? Daniel: It’s interesting because they’re both important. You can’t have the one without the other certainly. But to me the nuts and bolts takes a weekend. If I gave you my top five books and said hey, read these five books and read these articles and you’re going to understand the nuts and bolts of investing, diversification, management of fees, everything else. You could spend a long weekend and get there. But it would take you a lifetime to figure out and manage your own behavior. I would equate it to something like diet and exercise. It’s not complicated to understand that if you want to lose weight, your caloric expenditure should exceed your caloric intake, but you could read three books and get that, but it’s super hard to implement and it could take a lifetime of battling weight to try and get where you want to be. So the nuts and bolts are important, they’re just easy to learn and then you’ve got a long fight ahead of you. Tim: Right. Yeah, there’s a finite amount that you can learn about the different investments but there’s an unlimited amount that you observe about your own behavior and how your brain works so when you’re dealing with people on a day to day basis. Is it heavily more weighted towards trying to coach them into learning about their own behaviors versus teaching them about the different investments that they hold? Daniel: Yes for sure, and it’s worth saying that that’s not where people naturally see value a lot of time, and that’s not where people are naturally interested because once you introduce client behavior into the mix, they’re responsible. So they want to put it all on the financial professional and say look, generate some eye popping returns for me and we’re going to be just fine, it’s never that simple. There was a study I cited in The Laws of Wealth, my last book. I just love because it talked about the average or the best performing mutual fund of the early 2000 so from 2000 to 2010, this mutual fund got 18% a year annualized performance so just amazing annual performance. The average investor in the fund had to realized loss of 11%. And the way that it happened was that the fund, it was a concentrated stock fund. It would perform well, everyone would pile their money in. It would revert to the mean, everyone would go that was a mistake, the hot streak is over, they would jump out. It would go on a tear again, everyone would pile back in, rinse and repeat. And so even if your financial advisor could identify the best mutual funds or ETFs in the world, which they cannot. It wouldn’t matter if you can’t manage your own behavior so it’s the most important thing without a doubt. Tim: Totally agree. That’s something that we try and stress here to our clients as well. There’s got to be some interesting psychological behaviors when playing into bubbles, for things like Tilray and Bitcoin from last year, for individual people who might not be in the industry, how come it’s so difficult for people to realize when a bubble is happening? Daniel: Well, it goes back to the very first thing that we talked about which in my convoluted example with my croissant. It goes back to this reality that we evolve to believe that what our neighbors believe is truth and so if many, many people around us are agreeing and voting with their dollars that whatever cryptocurrency is valuable or this pot stock is valuable. We are wired fundamentally in every sense both literally, we’re socialized that way and we are wired that way to believe that it’s the truth so it’s very, very hard and I’ll tell you. I was a bitcoin skeptic at $1, at $100, at $1000 but when that sucker hit $15,000. I was like man, I was wrong. I missed the boat. I didn’t buy any but I said I missed the boat, and it was fascinating to watch my own behavior and to say I lost my head when everyone began to disagree with me, they were getting rich in the process. So it’s an incredibly tough thing. We are wired to buy into bubbles. Tim: And as you’re saying that’s kind of an eye opening saying no one is immune. If you’re a PhD psychologist and even you started doubting yourselves, the individual on an everyday basis is hopeless at that point, right? Daniel: Well, it’s why I still give my money to a financial advisor. It’s why I let someone else manage my money and pay him to do it because I’ve written three books on investor behavior but I know at the end of the day, I’m as stupid as the next person when it comes to my own money. There’s a lot of research that shows financial education works only when it’s product agnostic. You can teach someone like high level fundamental truths about money, but when you try and introduce stuff that they own and stuff that they hold, all bets are off, because then we can’t be dispassionate about it. I hire someone else to run my money even though I’m perfectly capable of it intellectually myself. Tim: Right, yeah. It just gets emotionally challenging when it’s your actual own money. It’s easier when you’re telling other people or you’re managing other people’s money, but when that is actually your own I agree. It becomes more emotionally charged. Daniel: There’s actually research that financial advisors help their clients to the tune of about 3% a year. That’s attributable to good, helping them make good financial decisions. 3% a year outperformance is monstrous over a 30 year time horizon but the research also shows that financial advisors aren’t very good with their own money. So it’s like being in love. You can tell your friend not to date that person but when you’re in love, you make all the same dumb choices you just advised them against. Tim: With all of this in mind, in the preview of the book. It says that there are a couple practical solutions for improving both behavior and returns with your investment. The book comes out in a couple weeks so without spoiling the entire book could you maybe just talk about one solution that you outlined in the book? Daniel: Yeah. We’re going to keep this podcast as scatological as possible. I’ve already talked about peeing and now I’ll talk about a toilet. One of the things that I encourage folks to do is do what I call explain how a toilet works, and so this comes from research done by Richard Fyneman. He would find that if you ask the average person like hey, Tim, do you know how a toilet works? Most people go yeah, I know how a toilet works. It’s not that complicated. You go okay, well tell me how a toilet works, and then it’s stuttering and stammering, and you realized you maybe don’t know so much. So I was at a party last thanksgiving where everyone but me was investing large sums of money in some of the uber speculative cryptocurrencies and I’m talking like not Bitcoin, fourth tier weirdo. Tim: Litecoin and like Ethereum and stuff like that. Daniel: Even weirder still. I was like well tell me, help me understand the mechanism by which this works and it’s stuttering and stammering and so one thing I tell people to do is if you can’t teach it, if you can’t explain it, or if your advisor can’t explain it to you, you don’t know what you’re doing, so that’s a good check on investment decision to say look could I explain this to a five year old and help them understand why this is a good decision. And if you can’t, you’re not ready to pull the trigger. Tim: That’s a conversation that we had with a handful of clients last year on that same topic that you were talking about. They came in and they said I want to invest in the blockchain. I said okay, well explain to me how it works and if you can do that, we’ll think about investing in for you. Knowing that they wouldn’t be able to give us that answer. So like you’re saying, giving a check in yourself on if you can actually understand what you’re investing in. Otherwise it’s borderline reckless to put your money into something that you don’t fully understand. Tim: You mentioned your previous book, The Laws of Wealth and you also co-wrote a book, Personal Benchmark back in 2014 as well. For The Laws of Wealth and this new book, The Behavioral Investor. What are some of the key differences between what readers found in the Laws of Wealth and what they can hope to find in the new book? Daniel: The Laws of Wealth is really to me about an exploration of what to do and the behavioral investor is a deeper dive on why we do the things that we do. Like the first half of the Laws of Wealth has what I call my 10 commandments of investor behavior. If did write it myself, I think it’s a very good introduction for investors of all stripes to understand that if I do these 10 things, I’m going to be okay. The Behavioral Investor is admittedly wonkier. It is a deeper dive on the mechanisms behind why we act the ways that we do. Tim: Would you recommend pairing the two books together? Tim: Not only for your personal benefit but for their knowledge as well. Daniel: Because if you buy them together, I make $6. No, so yeah, I think I would and I would begin with The Laws of Wealth. I think The Laws of Wealth. If you’re a new investor, I think The Laws of Wealth would be the place to start, and once you have that foundation, I think you can move on to the graduate level course that is The Behavioral Investor. Tim: Right, for someone reading The Behavioral Investor, if they could have just one big takeaway from reading the book. What would you hope that that takeaway would be? Daniel: Yeah, so I’ve given three TEDx Talks, and the first one was called you’re not that great. That’s the takeaway I think from The Behavioral Investor is that the paradox of realizing that you’re not that great. That you’re prone to all these missteps. That’s actually the key to greatness. Once you have this radical introspection and radical self-honesty, you can be on the way to making some serious money and making some great decisions elsewhere in your life. But it takes bursting a bubble of your own infallibility. Tim: Right, yes, kind of like you were talking about your ego earlier. Once you set your ego aside and realize that you’re not that great, then you can actually achieve greatness. Through the book writing process, like we’ve said this isn’t your first book. Over the span of all the books that you’ve written. What’s the most rewarding part for you personally about writing books? Daniel: This will sound funny but the most rewarding part for me is deciding what I believe. I write books because it gives me an opportunity to do a deep dive on all these ideas and some of them I adopt and some of them I leave behind. And so I think most people don’t get the opportunity to be that intentional about exploring and rooting out bad ideas and so I consider that a real gift and a blessing. The second thing is every time my book sells in a foreign market, it gets a foreign translation rights. I get to go out with my family and have that kind of cuisine. Daniel: The Behavioral Investor is not even out yet, and we’ve already sold the Chinese rights and so we have some good Chinese food coming up. So figuring out what I believe and good takeout are the two benefits of writing books. Tim: Well, those are two awesome benefits. Last question for you before I let you go, Daniel. Either professionally, personally, what has been the best piece of advice that you’ve ever received from another person? Daniel: I’d say that the best advice is that no professional success can compensate for failure in the home and so I’m a married, I’m a father of three, and I consider that my primary job, and that this whole behavioral finance thing is just a vehicle for buying tennis shoes and cleats and book bags and things for what’s my primary job. So my dad is always reminding me to put first things first, and I try and do that to the best I’m able. Tim: That’s awesome advice. Trying to keep what’s important in that number one slot of priorities. That was all the questions that I had for you today, Daniel. Thanks for coming on the podcast. I really appreciate you taking the time. Daniel: It was my pleasure. Thank you so much for having me. Tim: For anyone listening out there. We are going to link in the show notes to where you can find The Behavioral Investor. Again that comes out October 16th of this year, so be sure to pre-order a copy or get a copy when it comes out depending on when you’re listening to this. Also we’re going to link to the other books from Daniel that we’ve talked about as well. That’s going to do it for this episode of Living with Money. Thanks for listening, and we’ll see you on the next one.